Guest bathrooms and powder rooms are among my favorite spaces to experiment with new styles. They’re relatively small, which means you won’t need a lot of time or materials to totally transform the space. They’re also less frequently used, which means you can be a little bolder with your choices than you might for a full or master bathroom. If you’re hesitant about experimenting with dark colors or a high contrast design, a guest bathroom is a great place to test the water – and this one by Black Knight Group is a great example of how to strike a balance that’s bold without feeling overwhelming. Why It Works: High contrast color schemes are often the domain of modern design, which can make them feel a little off-putting if you’re not a fan of a really stark contemporary look. After all, we’ve all heard the advice: using dark paint will make your space feel small. But contrasting light and dark is really a fundamental of design, and combining elements that are very different in color is a great way to make your space pop, whatever the aesthetic. 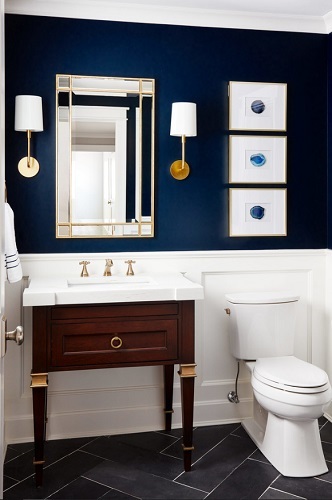 In this guest bathroom, the white paneling, ceiling, crown molding, lamp shades, frame matting, and grout all help temper the navy blue walls and slate flooring. Where solid blue walls might overwhelm the space, contrasting it with both large and small white elements lets you have that bold, dramatic color in a space that still feels crisp, clean, and bright. The dark mahogany vanity, in turn, keeps the lower half of the wall from feeling overly sterile, while the polished metallic embellishments throughout the bathroom both help cement the traditional look and cleverly draw the eye. Get The Look: First, you need to pick a paint color. A deep navy blue or teal is probably the safest option, but if there’s a color you really have your heart set on, almost any very dark gem tone will work. Then, look for 1/3 height white wainscot paneling and matching crown molding; beadboard and shiplap can work to create a more casual cottage style, but a raised panel or picture frame wainscot will help cement that traditional feel. The floor should be a dark stone like slate, marble, or granite with white grout – installed in a herringbone pattern for a little extra style. Look for a vanity that has a furniture-like feel, like a dressing table, and visible metallic hardware. Gold has a slightly bolder feel, but silver works just as well, as long as the finish is bright and polished, and all your fixtures (the faucet, mirror, sconces, and picture frames) match. A traditional white toilet is an obvious must (though I’m a fan of ones with smooth sides because they’re easier to clean!). Last but not least, find some art to round out your guest bathroom. The pieces here are custom made – sliced blue agate that’s mounted, matted, and framed – but you can find similar pieces premade, or just look for print collections in a color that closely matches your paint, on a white backdrop to help bridge the wainscoting and the ceiling. Working with bold, dark paint colors can be scary, especially when they’re up against light elements that double down on the contrast. But done right, this look can be striking without overwhelming, and is a surprisingly good way to build an assertive yet elegant traditional guest bathroom. This entry was posted in Bathroom, Bathroom Faucets, Bathroom Lighting, Bathroom Vanities, Decorating Ideas and Tips, Toilets and tagged get the look, guest bathroom, guest bathroom remodel, paint inspiration, Powder Room, traditional bathroom.